The secondary school 14-17 is a huge school project created by the constrained termite algorithm with the rules gleaned from the multilayered urban studies, programmatical studies, structural systems and green building principles. Key features are as follows. -The position of each of school bodies is determined in consideration of its surrounding community functions. i.e.the community bodies with the public access are oriented to the existent community cluster reinforcing it whilst the school body exclusively for pupils and school stuffs is oriented to the other side. -The canals, ponds and biotopes are created on the same areas as those in which, in the past the canals passed because the surrounding areas were port city areas across the river thames. This information is discovered in the multilayer urban analysis including studies of the historical data. Thus, it is expected that the soil conditions once reclaimed are allowed to be still useful to cultivate the canals, ponds and biotopes to resurrect. -Low-e coating sashless double glazing windows with the reflectance layer inside. Sashless glazing increases 10% to 20% of the sunlight penetration,more than glazing windows with the glazing windows with sashes. Furthermore, the reflectance layer can create a plenty of the direct sunlight inside by reflecting the the sunlight rays captured to the ceilng of the rooms in order to increase the luminosity of the inside until 11m of the depth. Furthermore, low e coating pane can decrease heat transmision through window panes in the form of either shutting the heat transimision or insulating it. shape and mutilayered glass for the single layer as a whole envelope. -The RC roofs and walls painted to white and the greenly monocoque glass glazing contribute for the daylight intake and so reducing the energy consumption of the artificial heating and lighting. -Zigzag configuration and the natural form of the building bodies produce intriguing spatial experiences and the striking identity to the area. -The big exterior and interior voids and the interior spatial organizations contribute for the microecosystem within and the natural ventilation such as cross ventilation and mixed ventilations to reduce the energy consumption of the air-conditioning. -The fresh air from the floating floors, continuously supplied to people in the interior. -The use of the low energy lamps and efficient mechanical gadgets reduce the energy consumption of the cooling and the heating..
-The flexible interior layout can adapt to the use of the different class rooms and curriculum variations with the adjustable partitions and lockers with the wheels. Furthermore, community corridors with the different width enable to gather with the adjacent class rooms, which contribute to increase rentability of the school. -Innovative structural systems such as grid and slim wall-columns to make the space bigger and integrated. 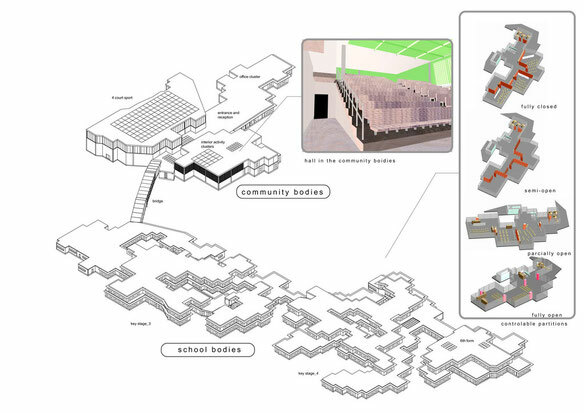 The community spaces are planned in consideration of the open school schema and planned to be located on the side of the existent community facility clusters in the site in consideration of the area management and the surrounding functions leading not only to forming the indispensable school functions but also to reinforcing the existent community functions in its neighbourhood and will optimize the space occupancy during the year. This indoor sport facility is embedded into the community body of the school. Key features are as fllows. -The external walls made of the concrete blocks. -Lateral glass in the upper parts of walls and the glass roofs with the grid ribs. -The structural system used:the columns embedded into the external walls and truss beams supporting the glass roofs with the grid ribs. -High portion of the unanimous daylight inside the indoor sport facility in tune with the adjacent blocks on the external faces, which gives a sense of unification for all of the school bodies and the formal characteristics to viewers. 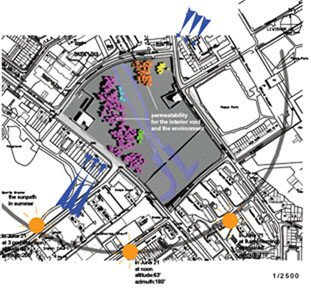 -The community block into which the indoor facility is embedded allows clustering of the varying multipurposeful facilities in the compact manner. -The conference hall/theatre characterized by glass windows in lateral walls and the rooftop window. -Lateral windows equipped with the adjustable louvers just outside window panes which control the penetration of the sunlight inside for the interior use. -Different facilities connected through the interior halls which divide different activities with the proper functions like acoustics ones and act as a lung(environmental void) for the ventilation and the intake natural light on the rooftop window. -The spatial organization of the community body designed completely taking into account the fire safety and evacuation strategy by planning that all of different programmes adjoin the exterior and the interior path allows the routes in two directions. -The ground floor reception which is large enough to serve as the retention space at the time of emergency and at the time of on-going event. This project is the second part of the architectural project using the constrained termite algorithm in my research work. It is carried out with site conditions (environment) and programmes(agents) different from those in the first part. The constrained termite algorithm is run with the rules expressed as functions, proximity, away, it doesn't matter, and neighbouring boundary conditions etc in order to reproduce a self-organized abstract building blocks. All of patterns shown represent the building blocks in a process like morphogenesis over a time and the modelling and designing of the building blocks with the algorithm over a time. All this designing is carried out during the longer hours a day within a week. The actual development of the computer technology like the High Performance Computing(HPC) will enable us to create those patterns in more shorten time span. The cellular automata which consists of a cellular grid with active solid and dead void reproduces a variety of 3d patterns as per rules set up, which serve as highly sophisticated conceptual model to be transformed into the real building volume. There is a typology of the built form or parcels based on relevant urban theories for so far and future urban development. Bearing it in mind, this project explores one another possible building pattern or parcel coverage using the cellular automata. very imminent problems to be resolved for the urban settlement and so greening of as large area of the threshold as possible is a predominant factor to be considered reconciling other architectural conditions like the profitable occupation of the building area of the parcel concerned. Also, the provision of very large and healthy environment contributes for the comfort(quality) or the rich sense of conceiving spaces of the users. -The setback, suitable for high rising buildings holding its environmental properties and its natural forms. -The creation of the stepped roof balconies for the rich external space, integration of the solar energy system and the passive design allowing the maximum intake of daylight and the airs to all of relevant areas in the highly dense blocks. 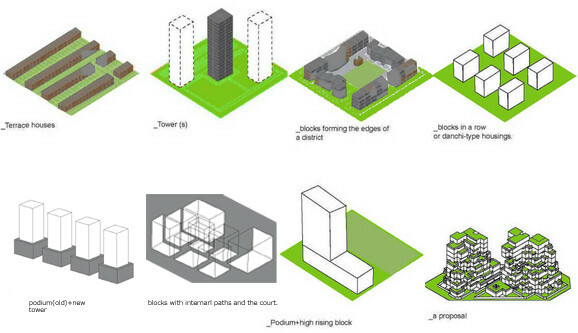 -The roof balconies with private green spaces per dwelling along with the public green areas within the threshold. -Green spaces as the conceiving spaces in place of the philanthropy spaces. -Varied interior layout allowing very environmentally optimized space allocations and the intriguing space experiences for dwellers. - Each of dwelling is duplex and near or more than 100 m2. - The skeleton infill(SI) and the open building for very endurable building use with very strong structural components, the ready renewal of the mechanical components and the internal zoning layout. - Finishes made of timber or wooden materials locally sourced with intention leading to the reduction of the dependency of the oily products and the increase of more sustainable materials. This constrained cellular automata(optimization of the conditions by proper rules) contributes to create very integrated and reconciled conceptual model for the project.